Sometimes the best recipes are born on accident. Mexi-lentil macaroni was created because I needed dinner and didn’t have much in the pantry. 90 minute man bread was born because we needed bread, we were short on time and my husband didn’t want to follow a recipe. 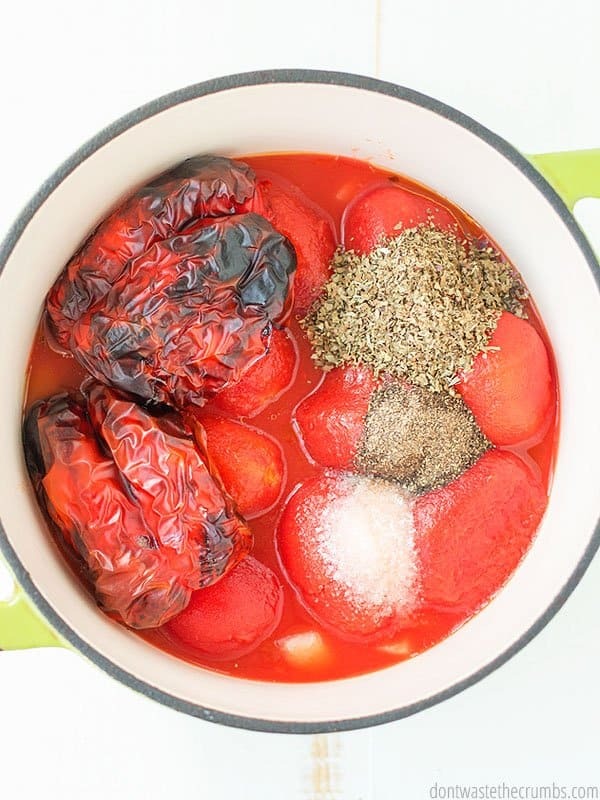 Roasted red pepper tomato soup can be attributed to finding a wrinkly red pepper that was originally intended for another meal, but wasn’t used. Instead of throwing it away, I put it in my family’s favorite soup. Having an alternate purpose for things in the fridge is what I call Plan B, and I teach this concept in depth in my course Grocery Budget Bootcamp. For today’s recipe though, it was pure experimentation. I had no idea whether adding a red pepper to the soup would work or not. In fact, my husband suggested I didn’t, in case I ruined dinner. But he was SO GLAD I didn’t listen to him that day, because he likes this soup even better than the original recipe! 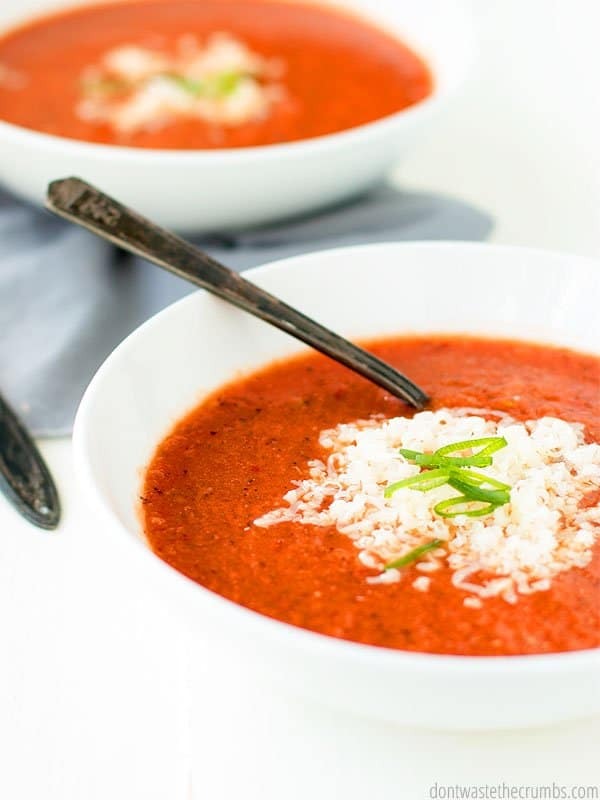 My original recipe for tomato basil soup is super easy. Canned tomatoes, homemade chicken stock, fresh or dried basil and cream all blended up right inside the pot with the oh-so-handy immersion blender until it’s ultra-smooth and delicious. One pot to clean and you’re done. It’s like your favorite pair of jeans, a t-shirt and flip flops. Comfortable, predictable, everyday. Paired with a grilled cheese sandwich on whole wheat bread and it’s one of my favorite childhood staple meals, only made with real food. 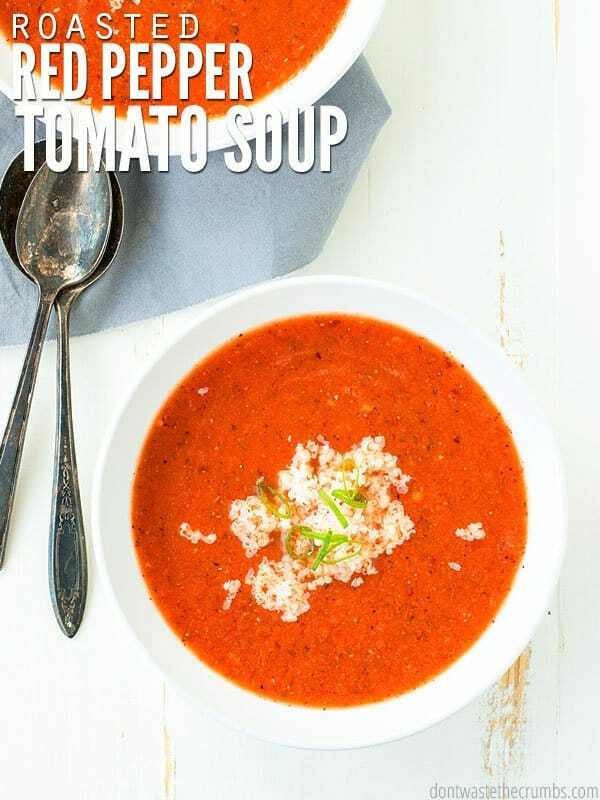 This roasted red pepper tomato soup recipe is super easy too, but it’s a bit more dressed up. It’s like a pair of skinny jeans, a flow-y blouse and booties. Chic, slightly sassy, fun. This is what I’d make if we were having company over for dinner, which I’ve actually done since we’ve had EIGHT different families visit us in the past 3 months alone. I made crusty no-knead artisan bread, but Mediterranean grilled cheese would be REALLY good too. 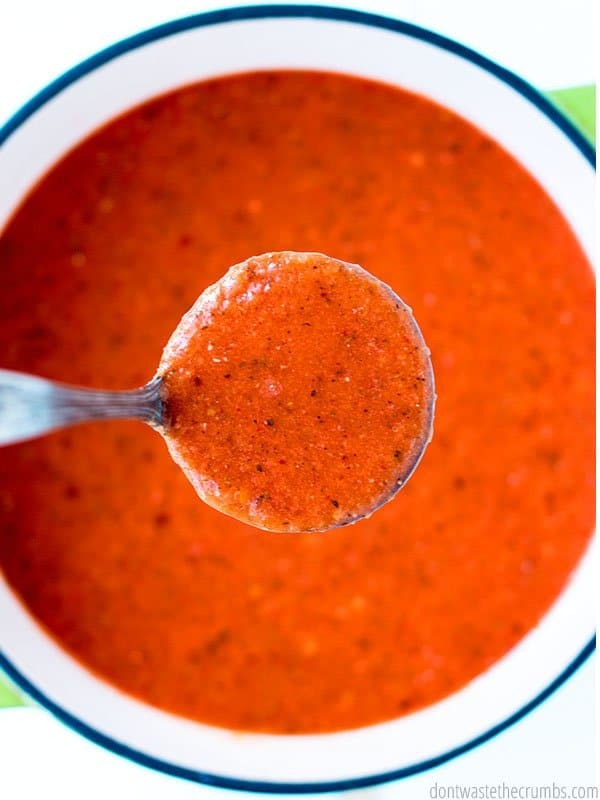 What makes roasted red pepper tomato soup go over so well with picky eaters is the fact that the pepper is ROASTED and RED. First, do not try this recipe with a green bell pepper. Green bell peppers have a very pungent taste and it will be very noticeable in the final soup. Red peppers are much more mellow, and sweeter than green. You could even use an orange or yellow pepper if you’d like, but I stuck with red since it’s the same color as tomatoes (picky eaters notice these types of things!). Second, you must roast the pepper. Roasting sounds a bit fancy, but it really means you’re going to char (a.k.a. burn) the pepper first – like the picture above. Super easy and great for those who tend to burn things anyway! Third, the pepper does NOT need to be roasted immediately before you make soup. You MUST roast the pepper, but work smarter. Fourth, you don’t have to peel the skin off the pepper! Almost every roasted pepper recipe I’ve come across has you peel the charred skin off the pepper before using it. I’ve made this soup both with peeling the skin and leaving it on and the only difference was the teeny tiny flecks of black in the soup. But if someone asks (a.k.a. the picky kid or picky spouse), those flecks can be pepper… or basil… if you catch my drift. You have tons of options and flexibility in this recipe, depending on what you’re looking for. Gluten free – NOTHING! This recipe is naturally gluten-free. Tomatoes – sub fresh tomatoes from the garden if you have them! And if tomato soup isn’t your thing, definitely try Kung Fu Panda Soup or Red Lentil Vegetable Soup. Both are hits in my family, but very different from tomato. First, char the red bell pepper by roasting it. You can do this by putting in the oven, directly on the grate under the broiler; on top of the gas stove, holding with a pair of long, stainless steel tongs; or on the grill. Set the pepper aside. Meanwhile, melt butter in a medium pot over medium heat. Add onions and garlic and cook until the onions are translucent, taking care not to burn the garlic. Add the tomatoes and chicken stock and bring to a simmer. If desired, peel the outside skin of the pepper off before placing it into the pot of soup. Otherwise, pull the stem off the pepper (it should easily come off) and place the whole pepper - seeds and membranes and skin - into the pot. Using an immersion blender, blend everything together until smooth. Alternatively, blend in batches in a blender (but be careful - it will be hot!). Add salt and pepper to taste. If desired, finish with milk or cream before serving. This is my husband’s new favorite soup recipe, which says a lot considering he didn’t want the red pepper in the first place! 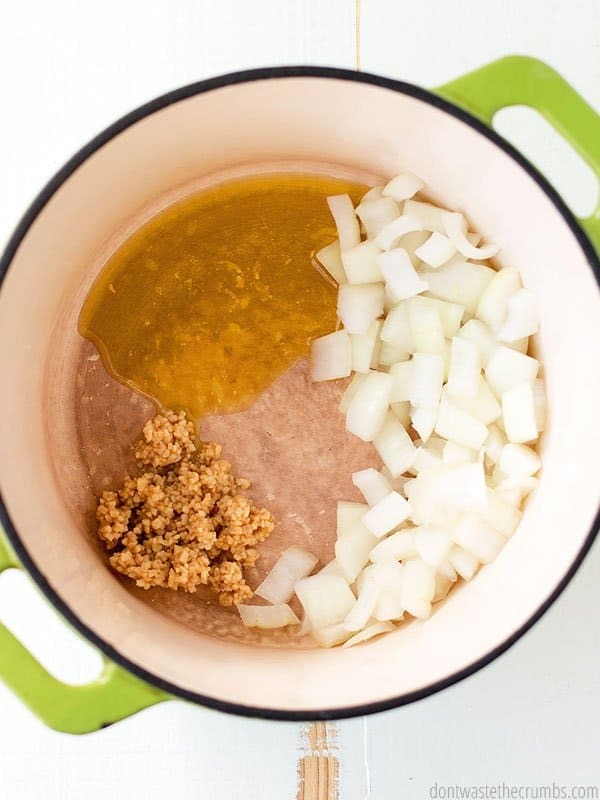 What is your family’s favorite soup recipe? I tried this one last year and it was a hit. This year’s garden tomatoes made a couple huge pots! I tried canning the soup this time…so I can enjoy it all winter long….Crossing my fingers it works. Thanks for sharing this great recipe!